Fire Emblem Fates will have a Manga adaptation! The Manga adaptation of Awakening is still ongoing. Just a litle time Ago Fire Emblem If (Fates on the West) has been released on Japan for the Nintend 3DS Family systems. Well now a Manga Adaptation is being prepared! Shin Kibayashi (Get Backers and the person who wrote the story for the games) is in charge of the Script for the manga adaptation. The Ilustrations are in charge of Kozaki Yusuke (No More Heroes, Fire Emblem Awakening/Fates). The Manga will appear on the Monthly Magazine of Young Magazine this fall. Fire Emblem Fates is a Turn-Based Strategy Game published by Nintendo for the Nintendo 3DS Family Systems. 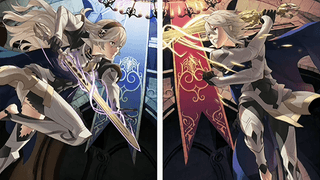 It centers on two countries at the crossroad of war, Hoshido and Nohr, and your character (who goes by the default nae of Kamui) will have to choose on which country will he align, or if he align to none at all. Also a new expansion for the TCG Fire Emblem Cipher will launch and will be based on this games. Here are the arts of Azura on both Hoshido and Nohr (BTW i know how to play the game, maybe someday i will put the rules and how to play them :P).